The Massachusetts attorney general's decision to unilaterally expand the state's ban of certain semiautomatic firearms is facing a new round of filings in state and federal court this month. The Second Amendment Foundation (SAF) announced on Wednesday a collection of gun-rights groups had filed an amicus brief in support of the plaintiffs in Worman v. Healey. That case challenges the decision in the First U.S. Court of Appeals. The National Shooting Sports Foundation (NSSF) announced earlier this month it would be supporting Baystate Firearms and Training, LLC and Downrange, Inc. in their effort to fight the action in state court. The retailers petitioned the Supreme Judicial Court for Suffolk County to have the action invalidated under state law. NSSF is also party to another ongoing federal challenge to the order, which a judge for the U.S. District Court of the District of Massachusetts ordered could go to trial after denying Massachusetts’ request to dismiss the case in March 2018. 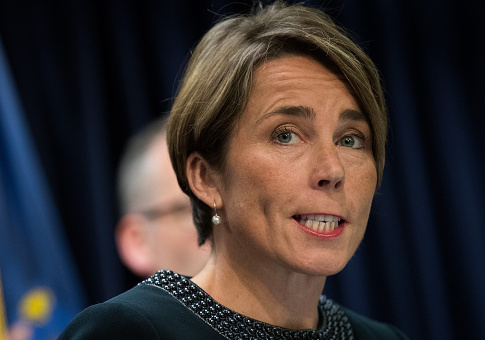 Democratic attorney general Maura Healey announced on July 20, 2016, that she would be unilaterally reinterpreting the state's decades-old assault weapons ban to expand what constitutes so-called copycat gun designs. Healey accused the gun industry of using "copycat" designs to skirt the law. She vowed to take action against "combat-style weapons." "The gun industry has openly defied our laws here in Massachusetts for nearly two decades," Healey said at the time. "That ends today. We have a moral and legal responsibility to ensure that combat-style weapons are off our streets and out of the hands of those who would use them to kill innocent people." Healey's order laid out a new test to determine if a gun falls under her new "copycat" definition. "A weapon is a copy or duplicate if its internal operating system is essentially the same as those of a specifically-banned weapon or if the gun has key functional components that are interchangeable with those of a banned weapon," Healey's announcement said. Gun sellers and gun-rights advocates immediately criticized the move as confusingly vague, in violation of state law for rulemaking, contrary to the legislature’s intent, and even unconstitutional. "With the 2016 ‘Enforcement Action,' the attorney general's office demonstrated how little it understands about firearms," Lawrence G. Keane, NSSF senior vice president, said in a statement. "Attorney General Healy and her staff clearly overreached their statutory authority and decided to legislate from that office without the benefit of any public process and in total disregard of 18 years of Massachusetts firearm law, under which firearm retailers operated. The attorney general undermined the state legislature by unilaterally declaring firearms that were legal to be illegal." "With this petition, these two retailers are stepping up to challenge bold overreach by an elected official that has not only compromised their livelihoods without any true enhancement of public safety, the press conferences and media interviews notwithstanding, but they are also speaking up for tens of thousands of law-abiding citizens of the Commonwealth of Massachusetts who, overnight in 2016, found that their legally-purchased firearms had been redefined as ‘assault weapons' while additional untold numbers of citizens were arbitrarily denied access to many models of semiautomatic rifles from that day on," Keane said. Gun advocates have complained that gun dealers and owners have been put in the uncomfortable and potentially dangerous position of trying to determine what constitutes a "copycat" gun under Healey's order. Given the similar nature of many semiautomatic actions, it's unclear exactly what is or isn’t considered an "assault weapon" in Massachusetts. That has lead many gun dealers and owners to worry they are unintentionally breaking the law. Alan Gottlieb, SAF founder, said Healey's decision to expand the definition is both "arbitrary and unconstitutional." "We could hardly ignore a case of such importance," he said in a statement. "The ban on so-called assault weapons now being enforced in Massachusetts under Attorney General Maura Healey's expanded definition is both arbitrary and unconstitutional. It cannot be allowed to stand, based on common sense and principles set down by the U.S. Supreme Court in the 2008 Heller ruling." Gottlieb went on to question the logic behind Healey's focus on "combat-style weapons" and said the Second Amendment protects Americans' right to own the firearms she has targeted. "This case goes right to the heart of the right of a citizen to choose appropriate arms for self-defense and other lawful purposes," Gottlieb said. "As our brief explains, the High Court has emphasized twice that the Second Amendment protection is not limited only to weapons useful in warfare, nor does that fact that a particular firearm might have military utility deprive it of Second Amendment protection. Because the law includes an exemption for law enforcement and retired law enforcement clearly demonstrates that these arms are suitable for self-defense because all arms carried by law enforcement are for defensive purposes. "The amicus brief puts it bluntly: The ban is unconstitutional." Healey's office did not respond to a request for comment. This entry was posted in Issues and tagged Gun Control, Guns, Massachusetts, New Gun Laws. Bookmark the permalink.